KPO purchase a new toy from Lazada - Xiao Mi: Mi Smart Scale to keep track of his weight loss journey but CZM thinks it is a waste of money. Hahahaha. The "kiam" part of me is also telling me that I should not be wasting money but the devils (Lazada and Xiao Mi) won in the end. What can I say, guys love electronics and games while girls love clothes, bags, and shoes? I first started my weight loss plan on 4th September 2017 - KPO Needs to Lose Weight and my weight was 83.5kg with a BMI of 27.9. I was tracking it manually using a spreadsheet but got slightly lazy. I knew all along that Lazada was selling it for $36 but I felt that it was too expensive. Do note that this is from the official Mi Store after my bad experience with fake stuff on Lazada - Bad Lazada - 128 GB SD Card for $12.27?!. However, Lazada tempted me with some credit card promotion together with my LiveUp rebate, the price was reduced to $25.89 which was equivalent to a 28% discount and the rest is history. As of today (27th October 2017), my weight is 76.9kg with a BMI of 25.6! I have managed to shave off 6.6kg (around 8%) in around 2 months including the 2 weeks we went Hong Kong and Indonesia for vacation and we eat non-stop! Speaking of which, I will be blogging about our vacation soon since CZM is too busy. I also like how Xiao Mi is so encouraging by informing me that I am lighter than 43% of the people around the area instead of heavier than 57% of the people. lol. If you notice, I have dropped the weight update on the recent posts because my friends are saying that it is too random. Hahahaha. 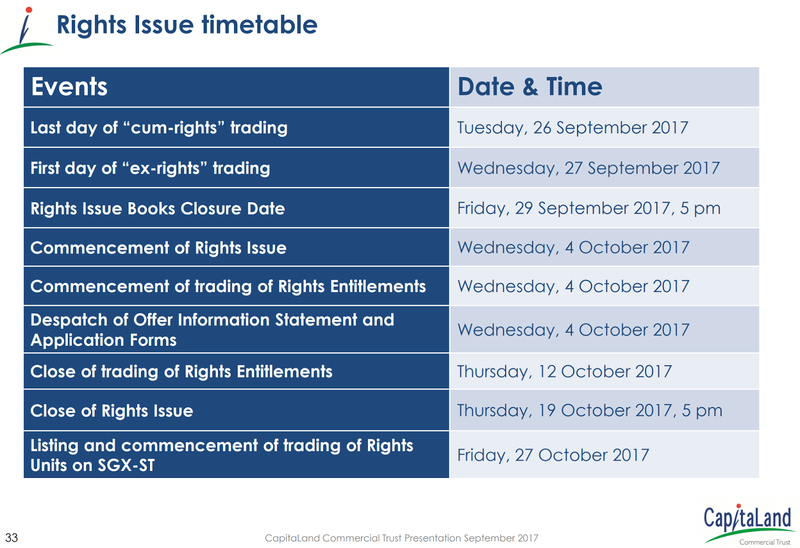 I made a mistake on CapitaLand Commercial Trust (CCT) rights issue! By now you would have come across the news - Capitaland Commercial Trust buys Asia Square Tower 2 for $2.09b. 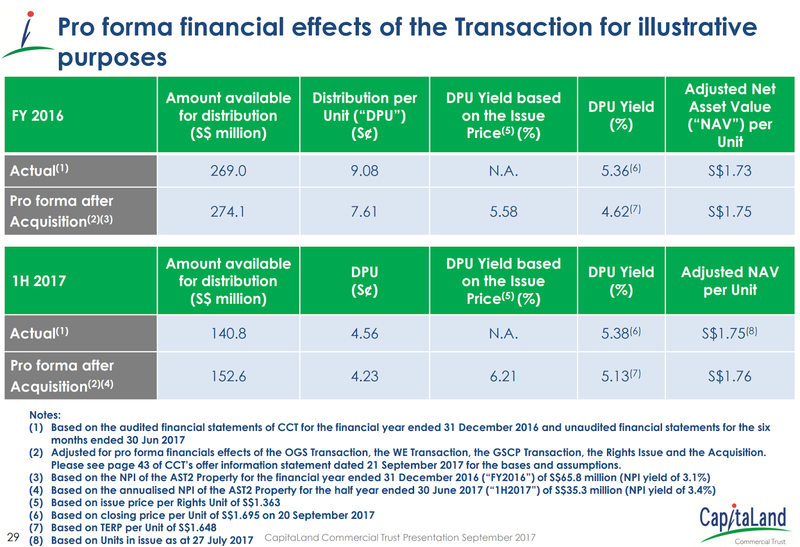 Although the acquisition is not yield-accretive (dividend yield decrease to 4.62% from 5.36%), KPO thought that it would still be a great idea to buy and hold CCT directly instead of the upcoming 3rd REIT ETF - Lion-Phillip S-REIT ETF. The rights issue presented an excellent opportunity for me to become a shareholder at a price lower than the market price if I were to apply/oversubscribe to the rights! 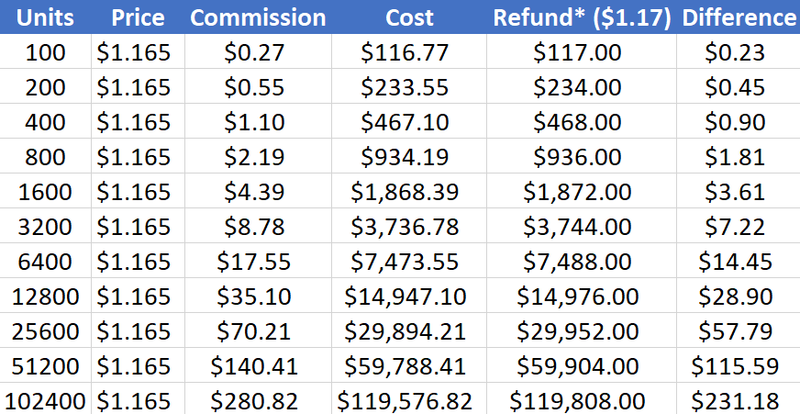 Technically, based on the theoretical ex-rights price (TERP) of $1.648 and a subscription price of $1.363, if I were to get my rights/baby shares at any price lower than $0.285 ($1.648 - $1.363), I would have the chance to get it lower than the market/TERP. Hence, I queued at $0.28 and got it on the second day when the rights started trading. 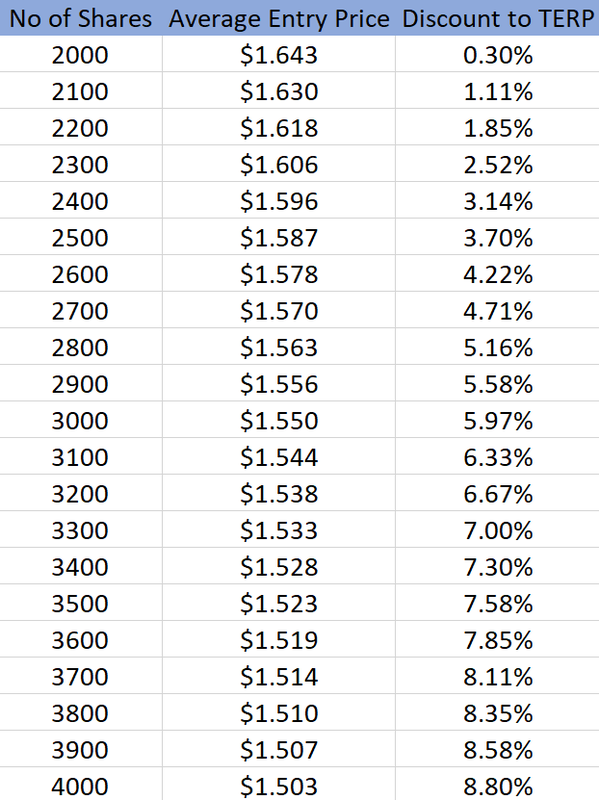 My plan was to buy 2000 rights and oversubscribe by another 2000 shares in the hope that I will be allocated some "bonus" shares at a cost of $1.363 which will reduce my entry price significantly. Today, I called SCB and told them my grand plan that I would like to subscribe to all 2,000 rights and apply in excess another 2,000 shares. The person said that it might not be possible and put me on hold. When she returned, she asked if I own the mother shares (CCT), I said no. 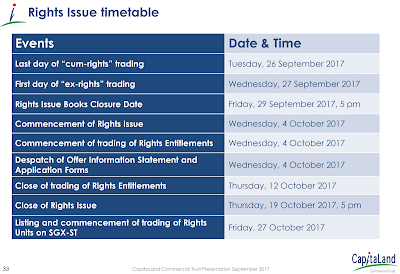 She replied saying that only those that owned the mother shares (CCT) as of the "Rights Issue Books Closure Date", 29th September 2017 can apply in excess. I went on to question her if the person sold off all his rights, would he still be able to apply in excess assuming he owns the mother shares (CCT) as of the closure date and she responded with a firm yes! This is not intuitive at all! The rights to apply shares in excess is not with the person owning the rights/baby shares but with the shareholder that sells you the rights. Do take note of this! To all the readers, this is the mistake I made and I hope that it will not happen to any of you! On the bright side, my total commission for owning 2,000 shares of CCT is $1.31 (0.04%). lol. Our StashAway September statement is out! If you are wondering, the statements are generated on the second week (Friday) of the month. I have yet to set up the automatic transfer last month as we were still deciding the final amount to be put into StashAway. Last month, we went on vacation and I forgot about it totally and only transferred the amount on the 1st October 2017 so there is no new deposit shown in this statement. Eventually, we decided to just stick with $500 for various reasons. 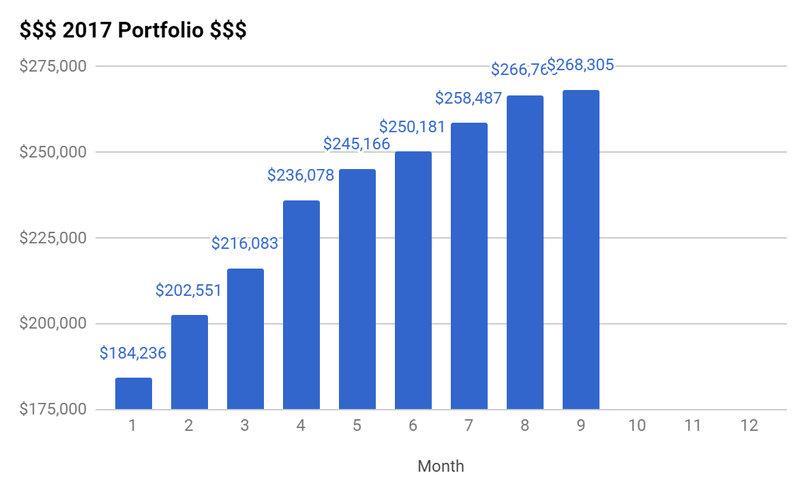 After all, our goal is to build a portfolio with dividends huge enough for early retirement so we prefer picking our own stocks. StashAway does not generate any cash flow and is used purely for capital growth. Our capital is $1,000 so that is a $3.52 gain. lol. 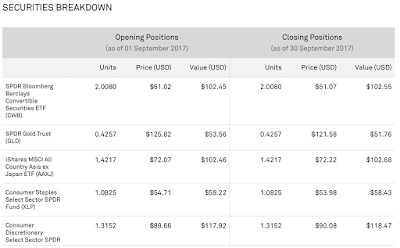 Interestingly, there is a -$5.52 difference between the opening and closing positions. 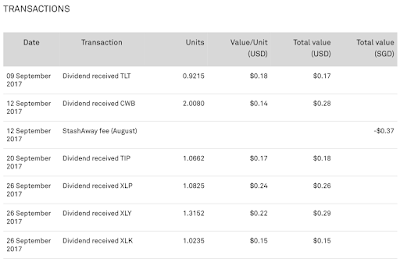 Cash USD increases because dividends were collected. Cash SGD decreases due to fees charged by StashAway. The fee for last month is $0.66. The total fee charged is $1.03. This month commentary: The last few days have excellent for stocks and the whole market is so bullish. Nikko STI ETF closed at $3.46 while SPDR STI ETF closed at $3.36. 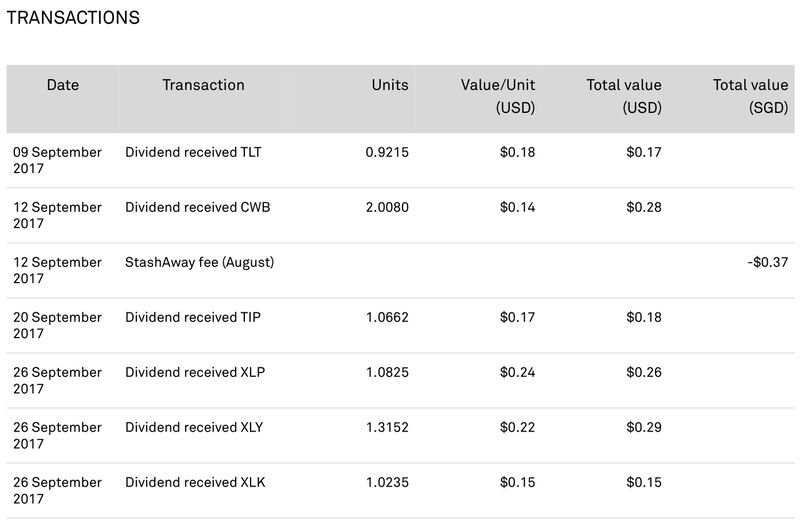 Currently, both STI ETF are generating a higher return than StashAway after fees. 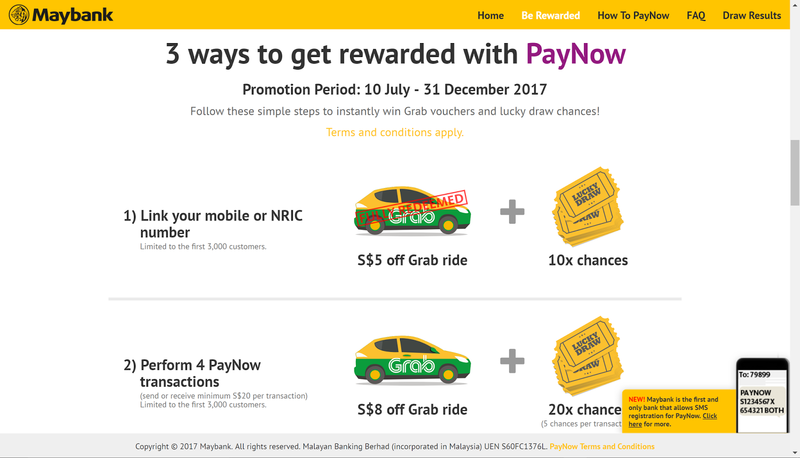 When PayNow was first launched back in July, I analyzed and wrote an article about it - PayNow and its Promotions. I recommended one to registered with SCB for the $10 or with OCBC to win their lucky draw. 2 days ago, I received an SMS from SCB stating that the $10 has been credited to my bank account :) Who doesn't love free money? Thank you SCB! SCB paid out $200,000 for this promotion - $10 for the first 20,000 eligible customers. Whoever working in SCB, your bonus must be awesome. lol. Any lucky readers that won any of the lucky draw?? CZM certainly did not win the OCBC lucky draw. Hahahaha. Surprise surprise, turns out the promotions are still ongoing! 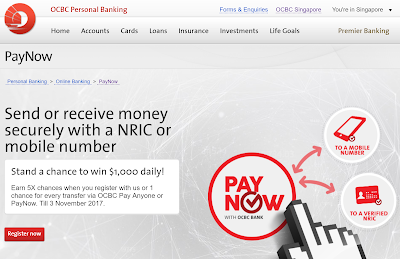 OCBC is having a $1,000 lucky draw from 5th October 2017 to 3rd November 2017 where there will only be 30 winners. You can read the T&Cs here. DBS is having a $500 lucky draw until 30th November 2017 and the lucky draw will be held on 15th December 2017. 80 lucky winners will be selected - T&Cs here. Do note that DBS lucky draw automatically includes customers who have registered as of 11th September 2017 so you will be competing with a much larger pool of people! 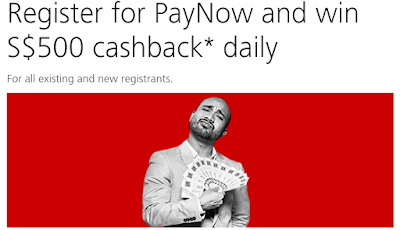 Citi PayNow Promotion 2 is giving $5 Grab promo code to first 10,000 eligible customers. Unfortunately, the promotion started from 14th September 2017 and will be ending tomorrow, 13th October 2017. On the bright side, who needs your $5 Grab promo code?! Grab has been giving out promo code in their battle against Uber and Comfort. T&Cs here. It seems like Maybank is still running the same lucky draw since July and have added one night stay at Resorts World Sentosa. Apart from that, Maybank is advertising that they are the first bank that allows registration using SMS. That is so impressive! Would you register because of that? lol. 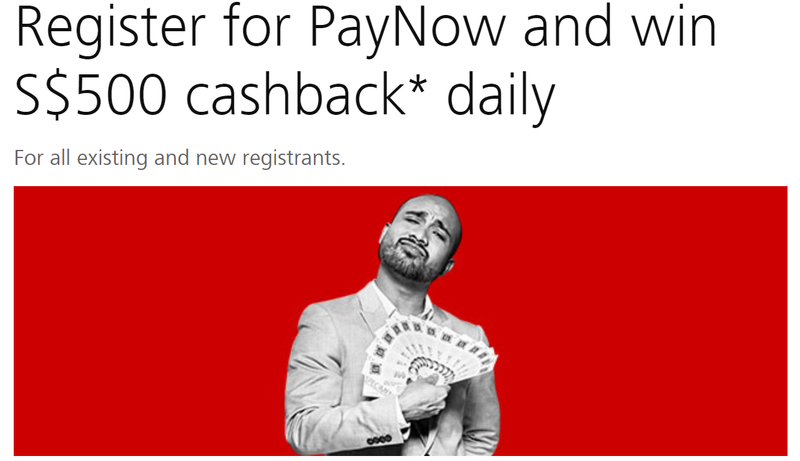 HSBC and SCB does not have any PayNow promotion, probably used up their budget. 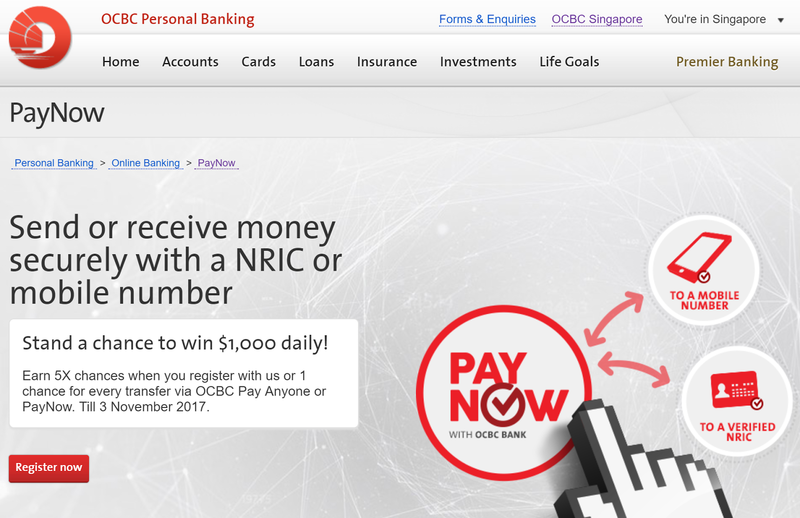 KPO will be registering with OCBC next! Sorry SCB, KPO will be going where the money is, loyalty doesn't pay. Hahahaha. We all know that Exchange Traded Funds (ETFs) are low cost passive funds but have you ever wonder/know how ETF works? Vanguard has an article explaining this - How ETFs work. Using Lion-Phillip S-REIT ETF as an example, the ETF sponsor is Lion Global Investors Limited and Phillip Capital Management (S) Ltd. The participating dealers would be the banks and brokerage firms (Phillip Securities Pte Ltd, DBS Vickers Securities (Singapore) Pte Ltd, Commerzbank AG and UOB Kay Hian Pte Ltd). The participating dealers applies for a creation unit (at least 50,000 units or more) from the ETF sponsor by either giving basket of securities, cash that equals the value of the creation unit or a combination of the two. In this case, I believe the payment is in cash and each unit is valued at a NAV of $1 per unit. The participating dealers can then "sell" them to retail investors or trade them in the exchange/secondary market. The participating dealers can redeem creation units (similarly at least 50,000 units or more) from the ETF sponsor and receives a basket of securities, cash equivalent or a combination of the two. This will probably takes place only after the ETF is listed on the exchange. Why is there a need to have these 2 processes? 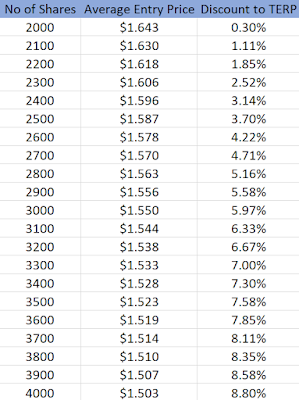 The reason is ETF arbitrage can take place where the participating dealers can make more money. This is slightly more complicated and you can research more on it yourself. In short, it provides liquidity to the ETF and it ensures that the market price of the ETF is close to its NAV. 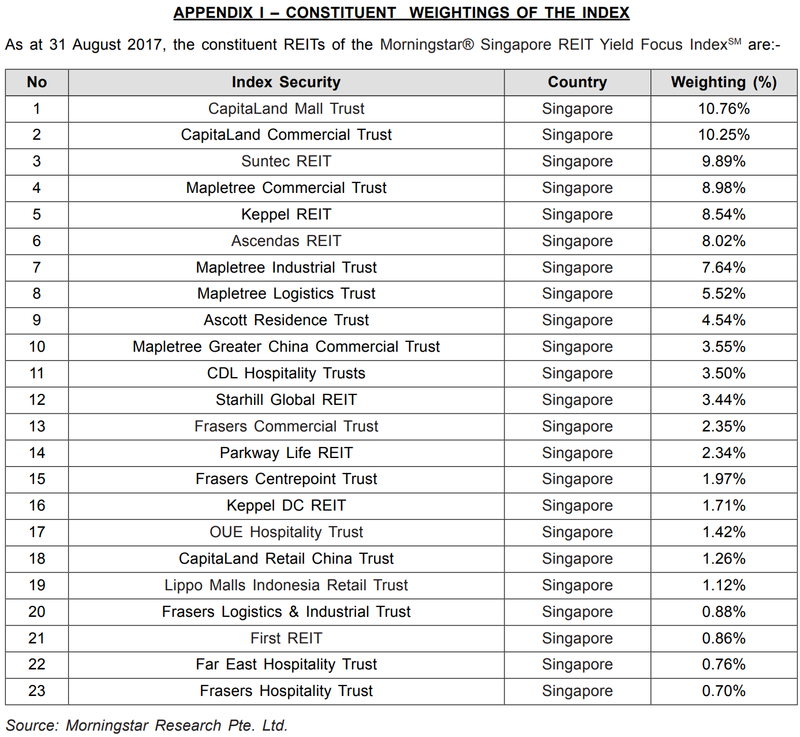 Since Lion-Phillip S-REIT ETF consists of only REITs from SGX, it might not attract investors from the region. 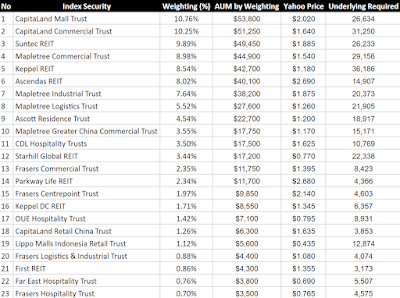 Hence, assuming each of the participating dealers were to create S$3 million of ETF shares each, Lion-Phillip S-REIT ETF would have an AUM of S$12 million. 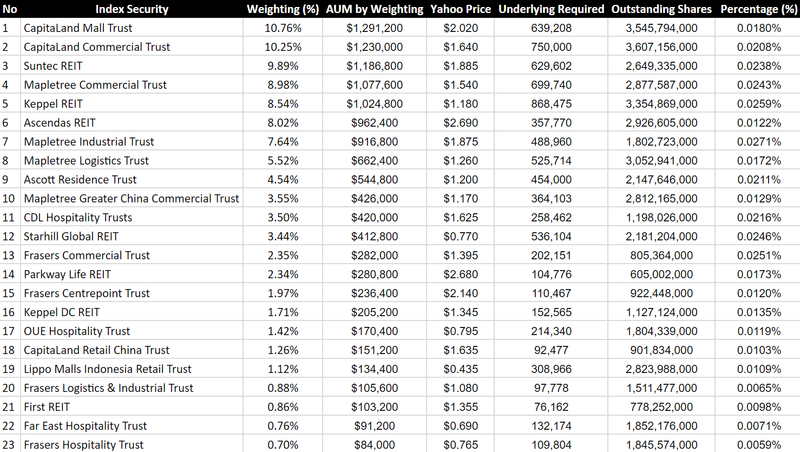 Based on the above weightings, I created a spreadsheet to estimate the number of underlying shares required for each creation (50,000 of ETF units). 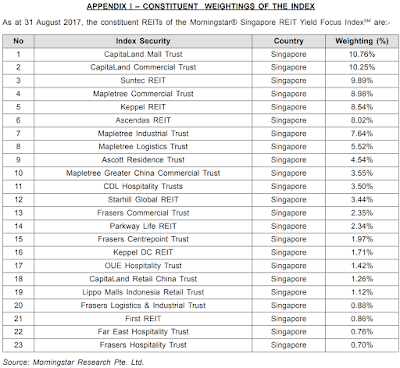 If we were to look at the top 3 stocks, each creation would require 26,634 units of Capitaland Mall Trust, 31,250 units of Capitaland Commercial Trust and 26,233 units of Suntec REIT. An AUM of 12 million would require 639,208 units of Capitaland Mall Trust, 750,000 units of Capitaland Commercial Trust and 629,602 units of Suntec REIT. 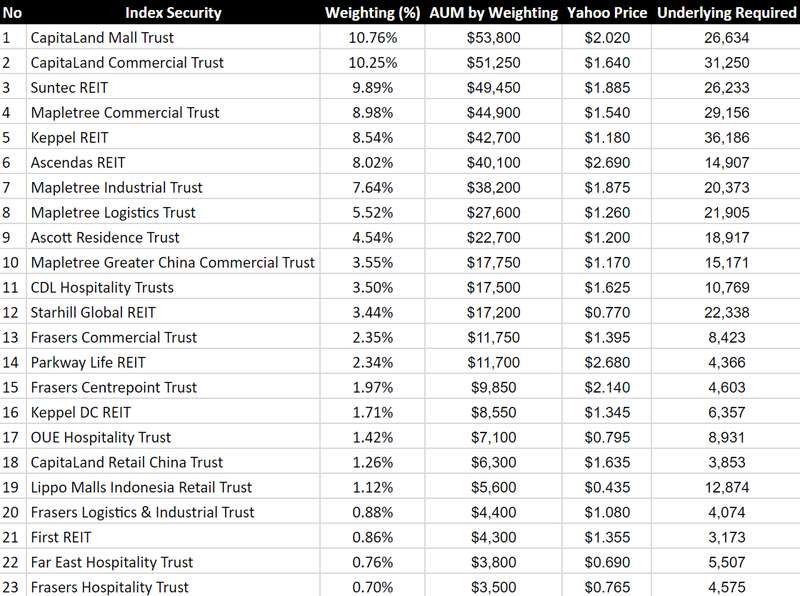 Would that actually drive the underlying REITs price up? I have no idea. lol. However, putting things into context, the percentage of underlying shares required from the outstanding shares is only around 0.02%. 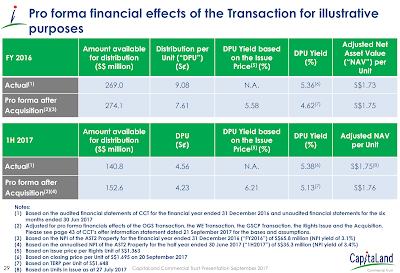 On the other hand, it was stated in CMT 2016 Annual Report that 59.38% of the shares are held with the public. This would mean about 3% of the public float would be purchased/held by the ETF sponsor for a S$12 million AUM portfolio. So what do you think? 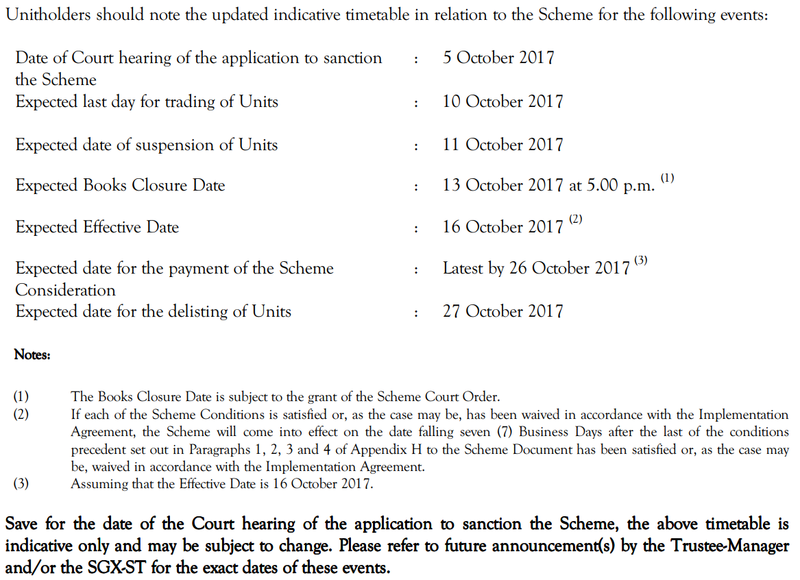 As you might already know, Croesus Retail Trust will be delisted on 27th October 2017 as it has been acquired - Blackstone makes offer for Croesus Retail Trust at S$1.17 per unit. A quick calculation shows that the return is about 0.19%. Assuming that I make the purchase tomorrow (4th October 2017 and hold till it XD/XE on 11th October 2017 - about 8 days), the annualized return becomes 8.82%! 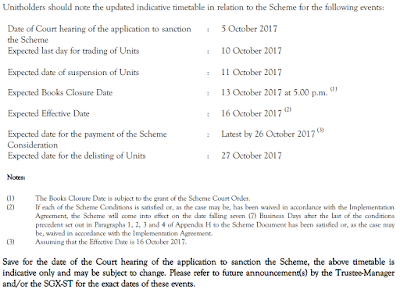 There is a court hearing to sanction the scheme so there is a extremely tiny possibility that it might not go through or even getting delayed. Hence, the market is pricing it at S$1.165 for people that want to get the money now and seal the deal. 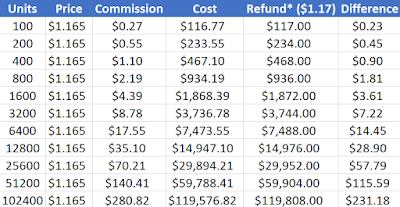 Our portfolio grew by 0.58% to $268,305 - $3,263.93 of capital injection which was partially offset by market moving against us, -$1,723.93! 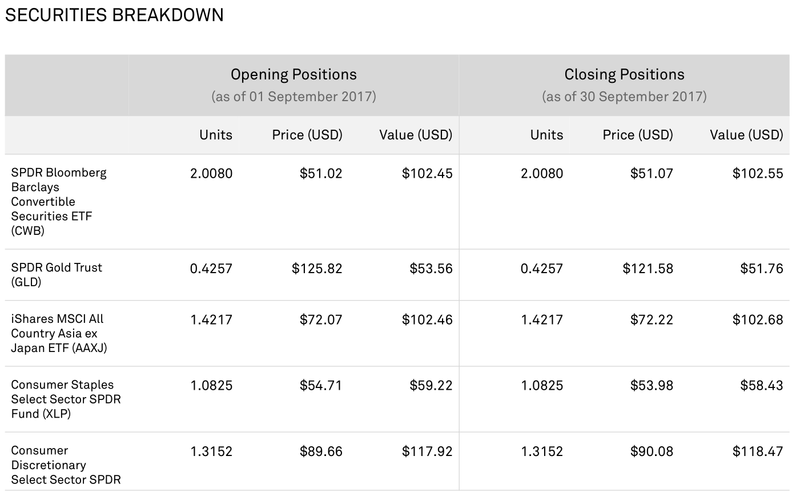 At one glance, the decrease can be mainly attributed to Soilbuild REIT (-$750), Guocoland (-$720) and Capitaland (-$560). Lippo Malls Trust is one of my "legacy" stocks which I have been holding for about 3 years (first purchased on 27-05-2014, back in my university days). If I remembered correctly, I bought it because it had a high dividend yield. lol. Anyway, Heartland Boy wrote an excellent piece on what is going to happen to it - Why Heartland Boy Sold Off Lippo REIT. In short, income support will be ending/ended + negative retail rental reversion will result in DPU dropping and the price will follow suit. Using the money from the sale of Lippo Malls Trust, I redeployed the capital to SingHoldings. It has a NAV of $0.6375 which is a 38% discount from my entry price. Most of the property/construction stocks have already ran up and this is slightly slower. 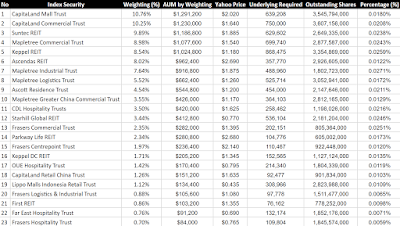 Assuming if it were to trade at the industry average PB of 0.7585, the price would be around $0.48. We are supposed to buy 1,000 units of STI ETF every quarter and it was about time.